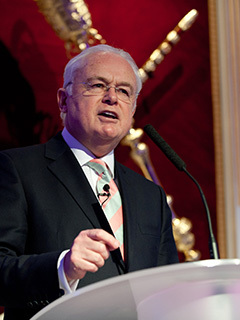 Martyn Lewis’s career is an unusual blend of the media, charitable and business worlds. During 32 years as a television journalist he anchored every mainstream national news programme on ITV & BBC (including News At Ten and the Six O'Clock News), and now works extensively in the voluntary sector. He is currently serving a second term as Chairman of the National Council for Voluntary Organisations (NCVO), and is Chairman of The Queen’s Award for Voluntary Service, President of United Response, Vice-President of Macmillan Cancer Support, Marie Curie, Hospice UK, East Anglia Children’s Hospices (EACH) and Demelza Children’s Hospice. He is also Patron of The Patchwork Foundation, the Do-It Trust, the quarterly broadsheet “Positive News” and Dementia UK. He recently chaired an Inquiry into executive pay in the voluntary sector and its recommendations were welcomed by politicians of all main parties. A long-standing judge of the Lord Mayor of London’s Dragon Awards, he is now its permanent Deputy Chair. He founded YouthNet, the award-winning charity which, since 1995, has been providing a comprehensive website (thesite.org) helping 16-25 year-olds, and which also created Do-It.org, the national volunteering database instantly linking people who want to volunteer with the right volunteering opportunity. He retired after 20 years as YouthNet’s Chairman in 2015, and remains an adviser to the charity. He campaigns regularly for more coverage of the achievements of the voluntary sector in the national media, and, more generally, for "solutions-driven journalism". In 2014 he became a Director of IPSO (The Independent Press Standards Organisation which replaced the Press Complaints Commission). He is also a Director of the TS Elite Group and PL Education Ltd, pioneering new techniques for helping pupils to learn. He continues to chair conferences and debates on a wide range of subjects – the most recent being an acclaimed one-hour interview with FW de Klerk and Sir John Major on world current events at the 10th anniversary dinner of the Global Leadership Foundation. In 2013 he returned to broadcasting to present a weekly interview programme called “Agenda” on “The Wireless”, a new radio station for the over-50s” created by the charity Age UK. In the 2010 and 2015 General Elections in the UK he presented a live closed-circuit interview programme for 1,000 guests at London’s Tate Gallery as the results came in. He is the author of several books which have recently been republished on Kindle, including Reflections on Success – verbatim interviews with 67 famous people across a wide range of professions analysing their success. He played himself in brief cameo roles in the TV series “The Vicar of Dibley” and “The Bill” and in the James Bond film “The World is Not Enough”. He appeared on archive footage in the films “The Queen”, “Argo”, “Senna” and “The James Bond Story”. Martyn holds an honorary Doctor of Letters from the University of Ulster (1994) and is a Freeman of the City of London, Fellow of the Royal Society of Arts, and a Member of the Garrick Club, the Pattenmakers Livery Company and the British Academy of Film and Television Arts. He was awarded a CBE for “services to young people and the Hospice movement” in the Prime Minister’s Honours list of 1997 and a knighthood in the 2015 New Year’s Honours list.